Flexible Solutions For Complete Telephone System Integration - The Strata DK424i system offers comprehensive features that meet your full range of telecommunication needs, whether your business is small or large. Equally important, Strata DK424i enables you to enhance your system with value-packed optional features at any time, delivering the exact level of performance your business needs as it grows. That's how Strata DK424i assures both maximum productivity and cost-effectiveness. Whether you require Voice Mail/Auto Attendant, Computer Telephony Integration, ACD/MIS call center functions or Voice Over Internet Protocol, Strata DK424i offers the optimum solution. Universal slot architecture provides configuration flexibility, allowing you to create almost any combination of trunk lines, telephones and peripherals. 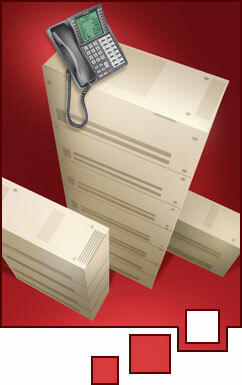 The system's scalable "building block" design lets you start small and grow as large as 200 lines or 336 telephones. Strata DK424i is also your solution for a distributed configuration. You can connect expansion cabinets remotely from the base cabinet, with fiber optic cables. Strata DK424i also gives your remote worker groups the same advanced telephone system functionality as your main-office employees. Simply use the branch-office extender products to provide digital telephone extensions from your main location's system. Strata DK424i extends the functionality of your main-office telephone system to remote worker groups, assuring maximum communication productivity for all your employees. Integrates voice, data, fax and video on one reliable line. Transmit multiple communications at the same time! With its superior speed and faster call setup, ISDN improves the efficiency, productivity and cost savings of all your business communications. Primary Rate Interface (PRI) saves money by enabling call-by-call use of channels. Basic Rate Interface (BRI) provides a low-cost solution for high-speed LAN and Internet access, plus video conferencing. No additional monthly charge for Calling Number Identification Services (CNIS) and Dialed Number Identification Service (DNIS). Enables your multiple offices to cost-effectively share applications and provide consistently high customer service. Voice and fax calls between your main office and branch office are carried via the Internet or your private intranet, eliminating long-distance toll charges between these locations. Significantly reduces cost, especially for international calls. Synchronizes telephone calls with computer applications and screen displays. CTI applications like caller identification, automated dialing and automated call routing enable your employees to handle calls with maximum efficiency. Dramatically improves call center effectiveness. Creates an integrated business information system that increases productivity and reduces costs. The Strata DK424i system is specially designed to provide the many benefits of Automatic Call Distribution (ACD), allowing you to distribute inbound calls among groups of call-handling agents. By managing your call center with Strata DK424i's advanced tools, you'll enable your employees to focus on their core responsibilities, maximizing their productivity and customer-service quality. Efficient call handling through automated call processing. Faster response to callers. Effective handling of call traffic during peak hours. Complete back-up coverage during heavy call volumes. Ability to accurately forecast call center staffing and facility needs. Effective management of the lines serving your call center. Stimulate sales by communicating pre-recorded information to callers while they're on hold. Enhance your call-center supervisor's ability to train, assist and evaluate the performance of agents, plus make immediate management decisions. Easily produce reports containing critical information and statistics on each agent's performance, call center group activity and system status. Strata DK424i's flexible solutions enable your call center to operate at peak efficiency today and in the future, delivering the ultimate call center management value. More efficient call-handling capability enables your call center employees to focus on important tasks. By improving call center productivity and customer service, you'll increase profits. Strata DK424i is designed to easily adapt to new technological advancements, so its functionality will grow with your needs. It's a smart solution for controlling operational costs and increasing productivity. Modular growth "building block" design saves substantial cost by enabling you to upgrade performance and capacity as needed, without significant capital outlays. Migration and compatibility allows you to reuse telephones from smaller and/or older Strata DK systems. Easy-to-use interface created with end-users in mind. LCD feature prompting makes feature access and use easier by displaying simple, clear instructions on the telephone's LCD screen. Reduces training time and makes sophisticated features less intimidating. User-programmable buttons automatically perform feature operation sequences at the touch of a button, saving time on every call. Ideal for frequently used features. Toshiba provides a variety of telephones to meet your needs, from speakerphones and digital cordless telephones to specialized answering solutions like the DSS console and attendant console. Provides concise information on every incoming and outgoing call, enabling you to make cost-saving management decisions. Helps make client billing easier. Ability to restrict long-distance toll access. Routes calls over your least costly trunk line or long-distance carrier. Connects seamlessly to high-speed digital services. No reprogramming when you move a telephone from one location to another. Program your system and test hardware from remote locations. All these important capabilities combine to assure that Strata DK424i will continue providing the ultimate cost-effective communication solution for your business in the future. Strata DK424i's modular approach provides a solid plan for cost-effective growth. Ease of use and cost-saving features assure ongoing value for your investment. Today, choosing the right communication system for your company is more challenging than ever. Since the success of all your communications depends on the reliability of your system, it's crucial to choose a manufacturer with a proven history of serving the ever-changing telecommunications needs of businesses. Toshiba is that manufacturer. The Strata DK424i system reflects Toshiba's commitment to designing and manufacturing telecommunication systems that will help customers be successful today and for many years to come. That's why for over 100 years, businesses have trusted Toshiba, a worldwide leader in business telecommunication systems. Quality and reliability you can depend on. Like all Toshiba telecommunication products, the Strata DK424i is designed to provide exceptional quality, reliability and value. Toshiba engineering innovations like compact component design, circuitry that minimizes power requirements, and power-surge safeguards make Strata DK424i more reliable than similar-sized systems, assuring top performance day in and day out. All of which is why Strata DK424i is the smart choice for unifying all your communications, streamlining your operations and saving cost. Click here for a full list of all features.